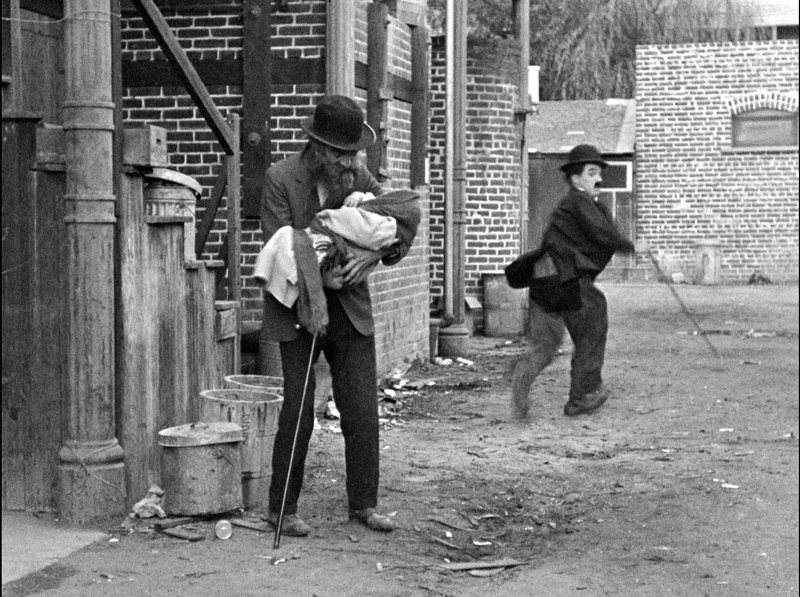 Charlie Chaplin’s masterpiece The Kid (1921) tells the story of the Little Tramp discovering, trying to avoid, and eventually falling in love with an abandoned infant, played out scene by scene at the end of this post. As I write in a prior post, you can see bystanders watching the filming, such as a delighted girl peeking through a screen door as Charlie strolls by a matron with a baby carriage. But where was this filmed? 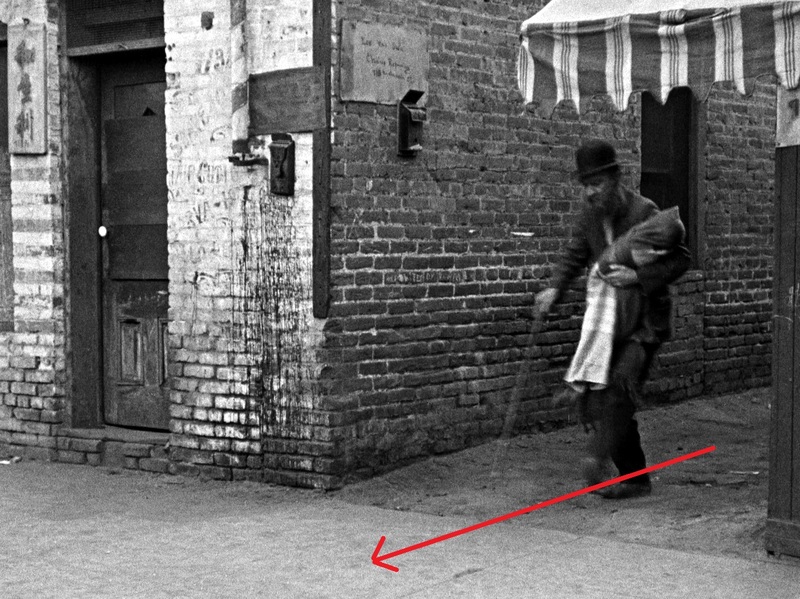 Likewise, Charlie gives the baby to an old man at the Chaplin-Keaton-Lloyd alley in Hollywood (left), but then the old man exits an alley beside a 713 address, nowhere near Hollywood. Where was this filmed? As shown below, every scene in the entire sequence leading to Charlie falling for the kid is now identified. While many of these locations appear in my book Silent Traces, and in other posts including How Charlie Chaplin Filmed The Kid, these two key scenes eluded detection for years. To begin, let’s focus on when the thieves discover there’s an abandoned baby inside their stolen car. This was filmed at the back of the former Rescue Mission, beside a rail spur branching off from the main rail line along Alameda, next to a crumbling brick wall. Although the above photo was taken over a dozen years later, the yellow oval marks where they stood. Below, the yellow “X” marks where they stood. Above, the yellow “X” and yellow oval show where the thieves stood when they realize there’s a baby inside the car. The aerial view directly above looks east, taken at the time Chaplin filmed, with building #2 on the corner of Alameda, running left-right, and Aliso, running up-down along the right. This entire view is now lost to the freeway. The red arrow above and to the right marks the old man’s path along an alley beside 713 N. Alameda. If you click to enlarge the movie frame, you’ll see “713” beside the doorway, and a sign on the alley wall that seems to say “Lew Wai Sun Chair Repairing 715 Alameda” – matching the 1921 city directory entry for chair repairer Lew Wai Sun at 715 N Alameda. The vintage Baist and Sanborn fire insurance maps confirm the alley setting at the time of filming, all just steps from where the car thieves discover the baby. The above photo (click to enlarge) shows the same 713 doorway appearing beside the old man, only the original alley and one story wood structure to the right are replaced by a brick two story building. The crumbling building where the thieves stood (yellow oval above) has been rebuilt. Next, I had long suspected the scene where the matron beats Charlie with her umbrella (above center) was filmed in Chinatown. After all, Chaplin filmed many other scenes there, and the shot of the thieves speeding into Chinatown from Alameda down Napier, above left, revealed some good candidate buildings on the right side of the street. But pesky facts got in the way. 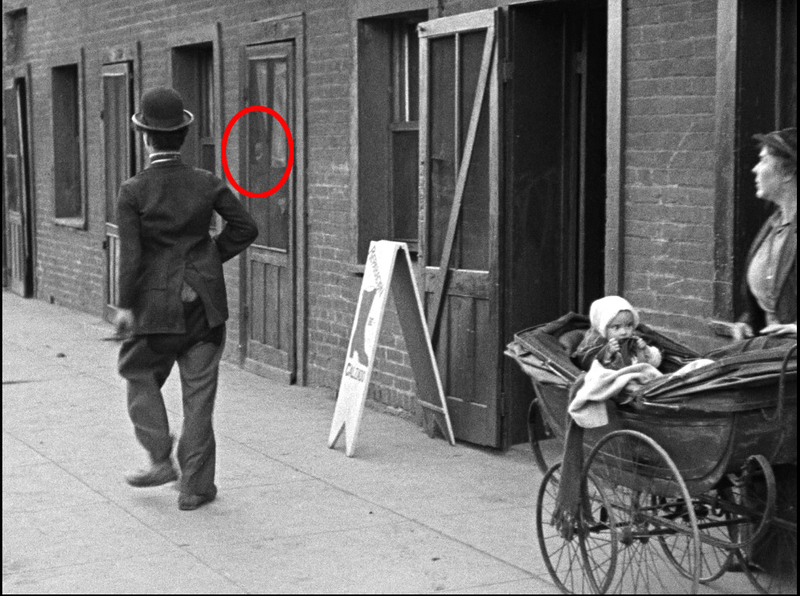 First, a reverse view photo of Napier (at right) showed these buildings had arched windows and doorways, unlike the rectangular windows and doors appearing in Chaplin’s scene. Further, the 645 address above the center doorway precluded any street within Chinatown. So I was stuck. A big break came when author Carrie Pomeroy contacted me with some questions about The Kid, and to share some information she had garnered after spending a week in Bologna, Italy (!) poring over the Chaplin Studio production records for The Kid. Dan Dillon, who plays the “legit bum” (Charlie’s not legit?) was busy the next day December 2, 1919, filming at three places – “Hall’s Alley, Chinatown and Mexican Quarters.” We now know “Hall’s Alley” means the Chaplin-Keaton-Lloyd alley in Hollywood, and that “Chinatown” refers to the alley at 713 Alameda. But where were these Mexican Quarters? To begin, this frame of the girl peeking at Charlie has a Spanish sidewalk sign reading “Reparacion de Calazado” or “Shoe Repair,” while a 645 address appears over a doorway. With Chinatown mostly east and south of the Plaza, I realized that “645” and “Mexican Quarters” might indicate the streets a few blocks north of the Plaza. So Carrie’s report put me on the right track. As it often happens, the best clues for solving a location are found in other films. Harold Lloyd, Snub Pollard, and other Hal Roach stars filmed frequently along New High Street north of the Plaza. 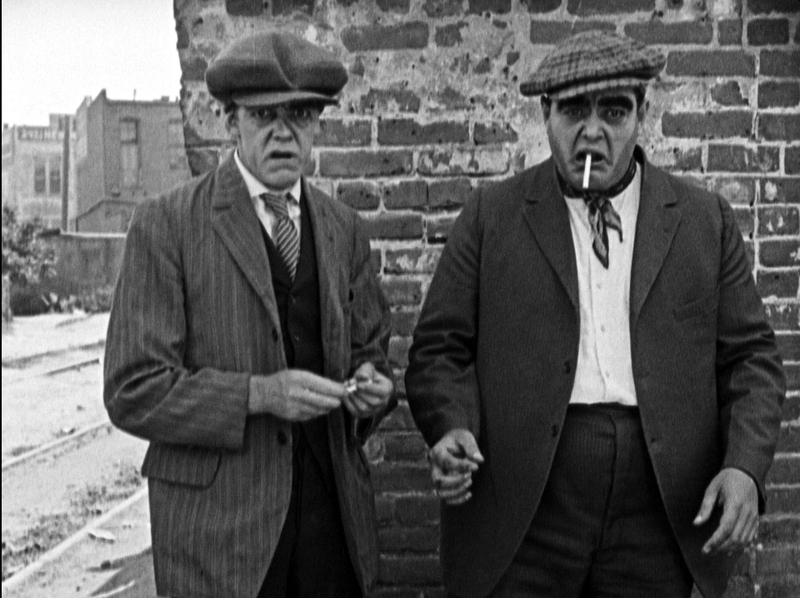 Somehow, when glancing at Lloyd’s appearance in From Hand to Mouth (1919), I noticed the low brick buildings with rectangular doors and windows, and made the connection. After a quick flurry checking maps and other features, it was clear Charlie had filmed on New High Street beside the same buildings where Lloyd had filmed. Above, views north (left) and south (right) of 641-643 New High Street (red box). During another scene in From Hand to Mouth, the gap between the buildings, spanned by a wooden gate support, appears in both views above. The corner of Ord Street appears behind Harold. As Harold travels further south down New High Street, the peaked roof (oval) behind Charlie comes into view. Harold returned in 1926 to film scenes from For Heaven’s Sake. Here, Harold runs south down New High towards the corner of Ord Street. Again from For Heaven’s Sake, looking north, Harold races a wagon south down New High from the corner of Ord Street. Last, a final view south on New High from For Heaven’s Sake, with the same “645” building (red box) in each shot. The building marked “Y” is a bakery built in 1923, replacing the building “Z” that stood during Charlie’s December 2, 1919 filming. Wrapping things up, Carrie also reported that Edna filmed at “Sunset Park” on December 4, 1919, Lafayette Park’s former name. While direct photo confirmation remains elusive, I’d long suspected Edna filmed her forlorn bench scenes here. The Los Angeles Times reports the city began plans to change the Sunset Park name in January 1919, with the new park name officially dedicated with great ceremony on September 6, 1920. Thus, late in 1919 the Chaplin studio records used what was then the correct name for the park. Lafayette Park is on Wilshire Boulevard next to the Town House Apartments at Wilshire on the corner of Commonwealth Avenue, where Charlie buys up all the Blind Flower Girl’s flowers in City Lights. The park is close to where Chaplin filmed several other movies, so it was familiar territory to him. So with Carrie’s help this final shot of the sequence was also identified. Here below is every shot in the sequence where Charlie first encounters and falls in love with the kid, followed by a brief identification of each shot. Edna abandons the baby in a limousine parked at 55 Fremont Place, later the home of Muhammad Ali, then enters Sunset Park. Thieves steal the car, and drive east down W. 8th Street, which shows the back of 55 Fremont Place. The thieves (identified by Carrie from the studio records as Albert Austin and A. Thalasso) discover the infant after parking the car behind the skid row Rescue Mission, where train tracks branch off from Alameda south of the Plaza de los Angeles downtown. Thalasso hides the baby at the north end of the Chaplin-Keaton-Lloyd alley in Hollywood, then the thieves drive down Napier Street from Alameda into the heart of the former Chinatown. Back at the Chaplin-Keaton-Lloyd alley in Hollywood (i) Charlies discovers the infant, (ii) tries to return him to Minnie Stearns, and (iii) hands the baby to Dan Dillon, the legit bum. NEW – returning south of the Plaza downtown, Dillon, the legit bum carries the baby at 713 Alameda. NEW – Dillon, the legit bum strolls near 645 New High Street north of downtown, and places the baby in Minnie’s baby carriage. 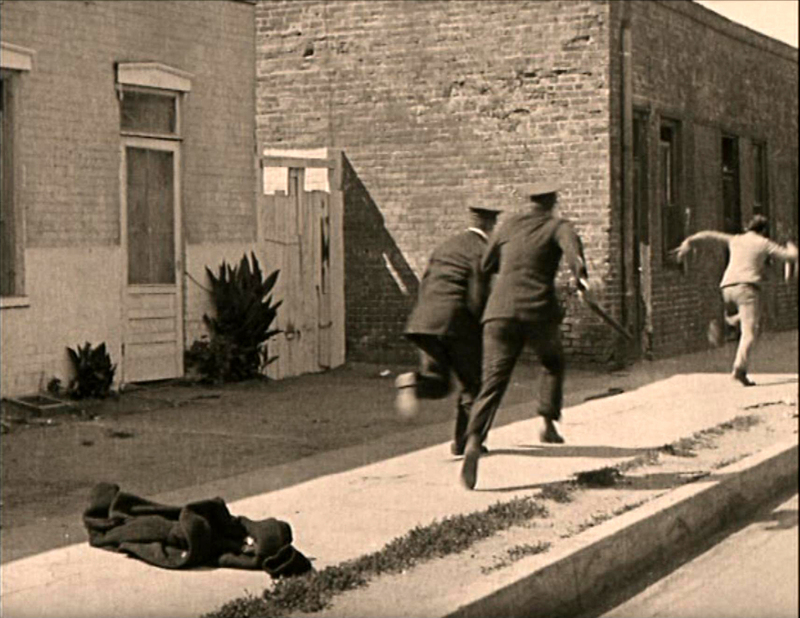 Charlie dodges a cop (identified by Carrie as Walter Lynch) back in Hollywood at the Chaplin-Keaton-Lloyd alley. New – back on New High Street, Charlie strolls past Minnie, who bashes him with her umbrella, and calls in Walter the cop. The sequence ends with Charlie sitting on a curb on a backlot set at his Hollywood studio at 1416 N. La Brea, where he falls for the kid, and decides to raise him as his own son. Carrie’s biggest surprise was discovering The Kid was not shot chronologically as she had expected. 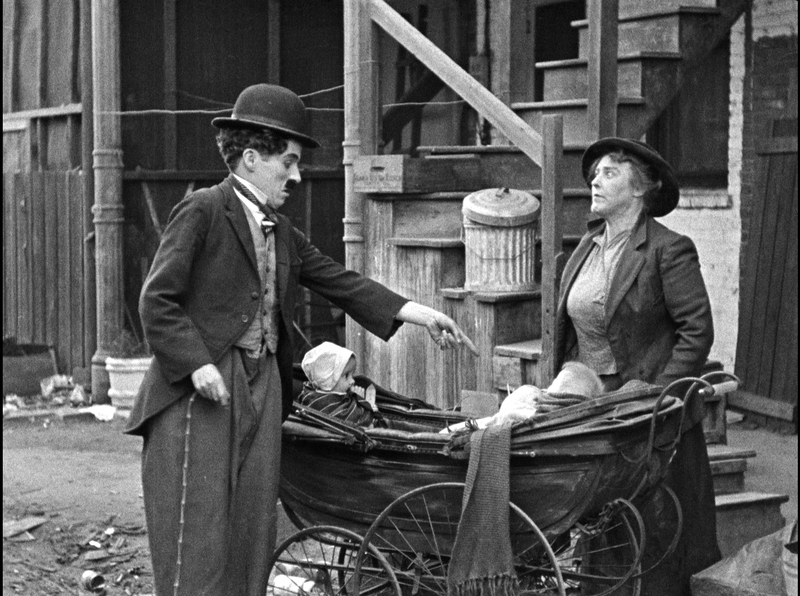 The scenes with Edna at the hospital and the thieves stealing the car and dumping the baby were the first scenes filmed in August 1919, followed by scenes with Chaplin and the baby in the attic and Jackie Coogan and Chaplin in the attic later that month. Scenes developing Edna’s story (the church wedding, the Pasadena Bridge sequence) weren’t shot until much later, in November, and to her surprise, the scenes here with Chaplin finding and trying to get rid of the baby were actually filmed in December 1919. The reception scene at which Edna and Carl Miller’s characters meet and the scene with Carl Miller in his artist’s garret weren’t filmed until February 1920. Carrie reports Edna and Carl’s outdoor balcony party scenes were filmed at the residence of Annie Stimson at 845 W. Adams Blvd., a home still standing. Click to enlarge. A final view north, showing the matron’s baby carriage (orange oval) on New High Street to the left, the circular Plaza right of the center, where the thieves discover the baby (yellow oval), and the alley beside 713 N. Alameda (red arrow, oval) far right. All images from Chaplin films made from 1918 onwards, copyright © Roy Export Company Establishment. CHARLES CHAPLIN, CHAPLIN, and the LITTLE TRAMP, photographs from and the names of Mr. Chaplin’s films are trademarks and/or service marks of Bubbles Incorporated SA and/or Roy Export Company Establishment. Used with permission. Check out the wonderful Blu-ray edition of The Kid – Criterion Collection. Below, the site at 645 New High Street, now a parking lot. This entry was posted in Chaplin - Keaton - Lloyd Alley, Charlie Chaplin, For Heaven's Sake, Harold Lloyd, The Kid and tagged Alameda Street, Chaplin - Keaton - Lloyd Alley, Chaplin Locations, Charlie Chaplin, For Heaven's Sake, From Hand to Mouth, Harold Lloyd, New High Street, Ord Street, Silent Comedians, Silent Comedies, Silent Movie Locations, Silent Movies, The Kid, then and now. Bookmark the permalink. Thank you Michael. Given I’ve found all of the locations in Cops, and now essentially all in The Kid, I’ve wondered about doing small books limited to each film. This is stupendous! I’m doing back flips over the way you put the pieces together to solve these mysteries. I did want to add one slight clarification. While they did shoot 280 feet of film on July 31, 1919 at what was identified in the production records as “Charity Hospital Exterior,” it’s not clear where they filmed, and I suspect that footage was never used. 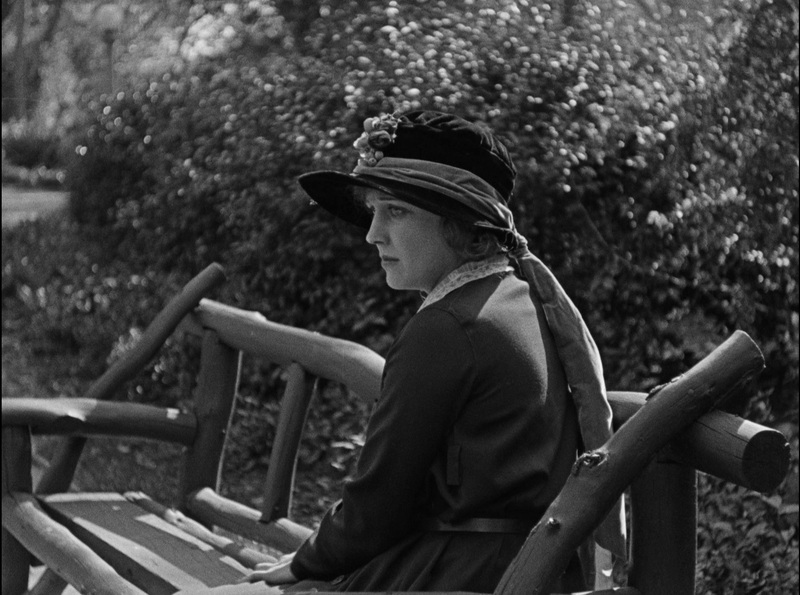 The scene that made it in the film of Edna leaving the hospital, which you’ve previously ID’ed as being shot at the former Occidental College campus, was filmed on April 21, 1920. That was after Chaplin screen-tested Beulah Bains, the actress who played the bride in a wedding-party scene that was later cut from the film, for Edna’s part out at the Occidental College site on April 19, 1920. He apparently quickly thought better of that idea and stuck with Edna. Thanks for this amazing work! What joy to see this all laid out in this way. SPECTACULAR work, John! It’s hard to believe that every location from The Kid has been discovered – nearly a hundred years later! And a BIG THANKS also goes to Carrie Pomeroy for tracking down the documents required to track down these locations! I’ve always wondered where the Edna Purviance park scene was filmed. The park is so beautiful in The Kid… sadly, Lafayette Park doesn’t look nearly as nice nowadays. By the way, John – when you write “The reception scene at which Edna and Carl Wilson’s characters meet and the scene with Carl Wilson in his artist’s garret weren’t filmed until February 1920”, I believe you mean Carl *Miller* https://en.wikipedia.org/wiki/Carl_Miller_(actor) – perhaps you are confusing him with Tom Wilson, who played the cop who chokes Charlie through the broken window? Once again, thank-you! It was a great pleasure reading this post! If I may ask a favor, John, do you have the USC Digital Library link for this photo? The USC link posted below the photo is incorrect. It looks like a fantastic photo, and I’d love to take a look at the original! Many thanks, John – that is a terrific photo! You’ve demonstrated again that you’re the premiere archeologist of American silent comedy! Great work.